I’m sorry that I’m not doing my regular weekly dinner menu post, but this considered a vacation week, so I’m kind of taking a vacation from cooking (until Thanksgiving that is). I’m also in the process of moving my site over to Wordpress, so I’m going to be busy working on getting that up and running with the help of my HTML goddess Wendy, thanks Wendy! I can’t wait to move over, as I’m feeling limited on blogger and have finally decided that it’s time to make the move! I promise to have my weekly dinner menu up and running next Sunday. If you love kale and mashed potatoes, then you will love these. Zoe and I were looking through Sprouted Kitchen’s new cookbook one afternoon where she saw the photo of these potatoes. She bookmarked the page, and told me that I had to make them. I think her love of potatoes comes from John, as he loves any kind of potato dish. I honestly love what a foodie my daughter has become. She would have never asked for potatoes with kale a year ago, (come to think of it, I don’t think I would have either) but our tastes change and grow, and now she and I both love kale. These potatoes are the perfect comfort side dish to any steak, chicken or even a nice big salad. 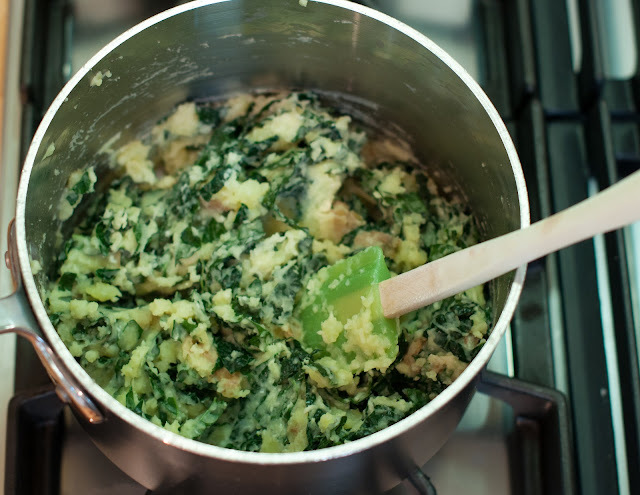 They’re sort of a healthier mashed potato with the added kale, but they still taste rich and creamy like mashed potatoes should. Eli even likes these, so I guess you could say that they’re kid friendly. 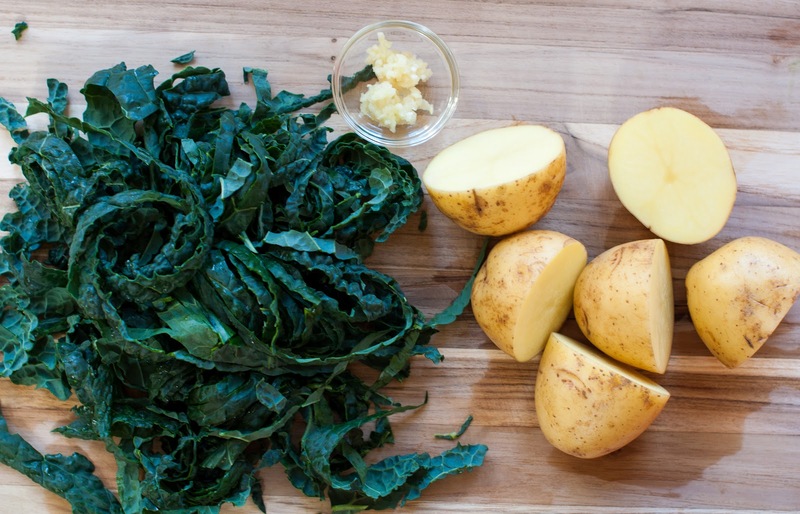 If you’re new to kale or don’t want all that kale in your potatoes, then cut back on the kale, maybe just add half or even a quarter of a bunch. They will still taste great and have that pop of green color along with some vitamins. Note: I typically cut the below recipe in half for my family. Prep all of your ingredients, wash, de-stem and slice your kale. I sliced my kale into thing strips and then chopped them up a bit more. Mince your garlic and wash and cut your potatoes in half. I kept the skin on the potatoes, as it gives the dish a more rustic look, saves on prep time and gives the dish more fiber. Note: The photos below show a half recipe, as I cut the recipe in half when making it. If you need help with cutting the recipe in half, let me know and I will add the amounts I used. 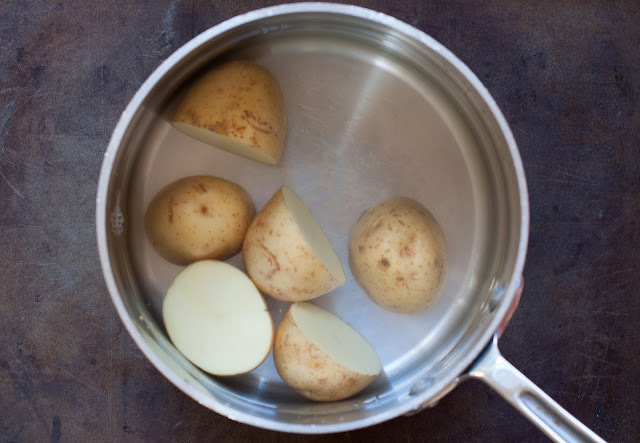 Put the potatoes into a large pot and cover them completely with tepid water. Add a few pinches of salt and bring the water to a boil. Cook until the potatoes are tender, 20-25 minutes. Note: If your water is boiling over, then turn down the heat a bit. 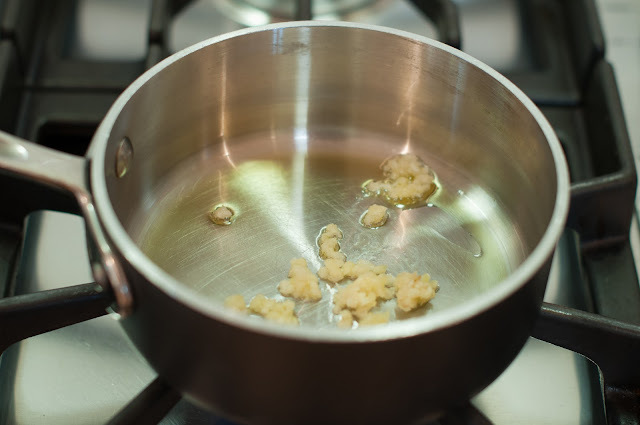 While the potatoes cook, heat the 1-teaspoon olive oil and the garlic in a small sauté pan set over medium-low heat, and sauté the garlic until softened, 1 to 2 minutes. Set the garlic oil to the side. When the potatoes are tender, drain them and return them to the pot. Add to the potatoes, the 1/3 cup olive oil, the garlic oil and 3/4 cup of buttermilk, (or in my case, half of the buttermilk and half of the 1% milk). 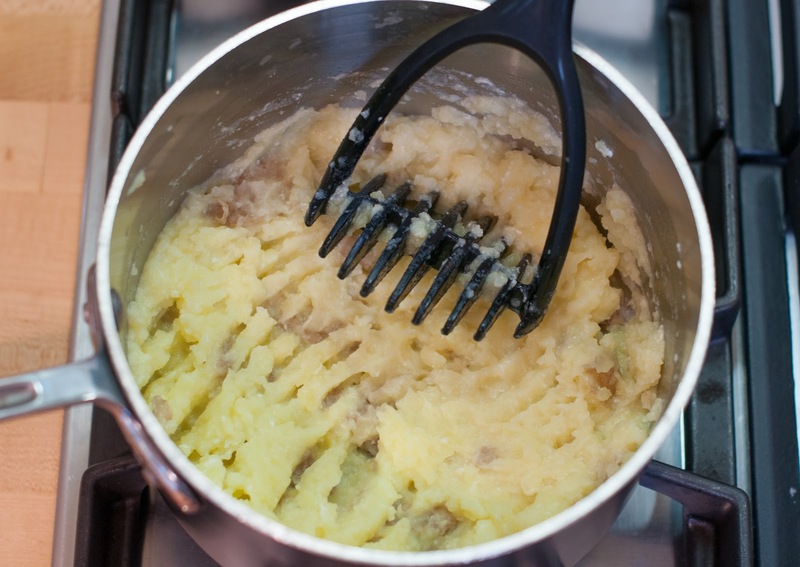 Using a potato masher, mash the potatoes together with the liquid ingredients until you get a smooth consistency. 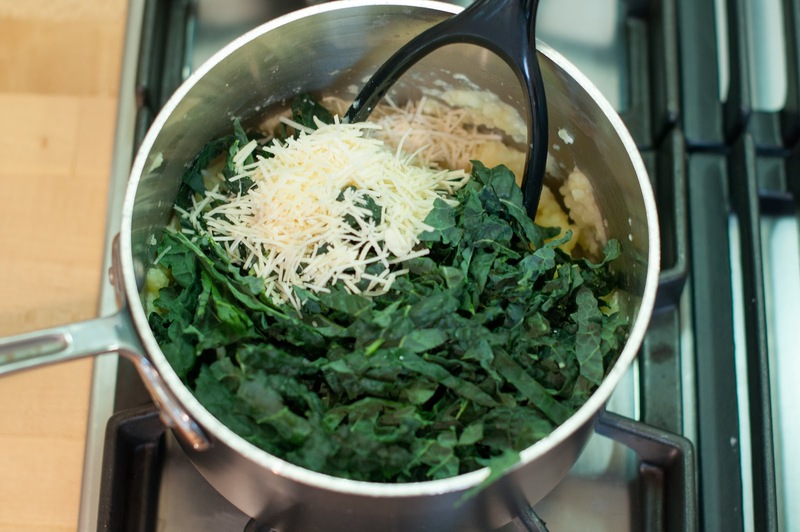 Add in the kale and the Parmesan cheese and mix and mash them all together. 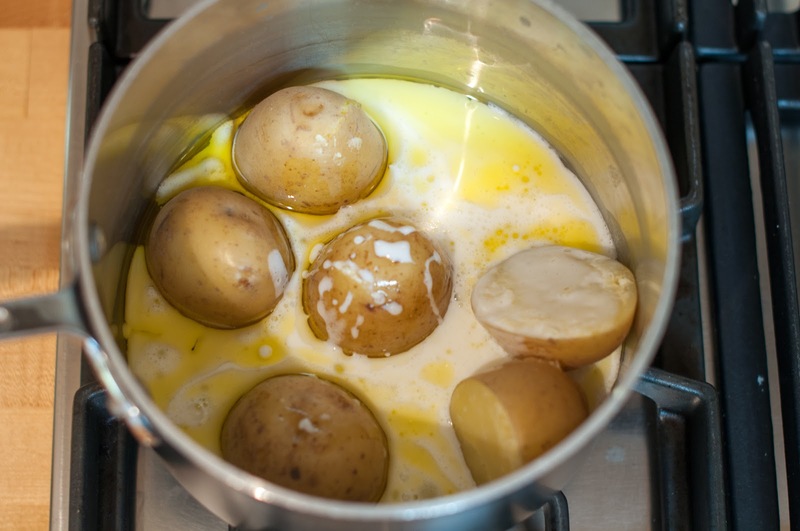 Add in the remaining 3/4 cup of buttermilk (or the rest of the milk and buttermilk) until you get the potatoes to the consistency you like, remembering that they will continue to absorb moisture as they sit. Stir in the 1 teaspoon of salt and some pepper (optional) and give the potatoes one final mix. Taste and see if you need to add more pepper, salt or olive oil if they need more moisture. It’s all about individual taste baby! Serve these mashies up alongside your favorite meat or salad. We love to pair these alongside our two favorite chicken dishes, chicken with shallots and lemon chicken. Got leftovers? To re-heat the potatoes, just put them in a double boiler over a simmering pot of water. 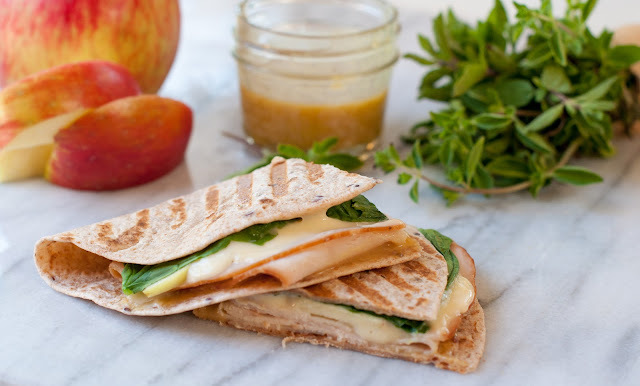 Stayed tuned for Wednesday, when I will post these turkey wraps with apple and brie. These wraps are a great way to make use of all that leftover turkey. Are any of you doing anything fun for Thanksgiving? We’re staying local and being mellow, and I’m so happy about that! Have a wonderful Thanksgiving and don’t forget to make up some cranberry orange sauce. Thanks for all your sweet comments ladies. I did make the switch to word press and I’m still trying to figure out how to comment and reply and do everything else. It’s a big learning curve. I see that you have moved to workpress. I’m still not brave enough yet to move my blog to workpress or .com. Anyway, my blog is just for fun only with no business involved and so moving or not doesn’t really matter to me. I can see that you like cooking a lot with kale and like your healthier version of mashed potatoes. kale mashed potatoes?! So YOU 🙂 – I love it! Happy Thanksgiving!!! Oh I love this! comfort with a side of health!! I’ve seen that cookbook and have been tempted – I’m sure I’ll give in sometime soon! These look fabulous, I may just swap out my regular potatoes for these on Thanksgiving. Good luck with the move to wordpress…been considering that myself and I’d love to know how it goes. PERFECT sounding potatoes and I have been wanting to pick up Tara’s cookbook for awhile – and you may just have convinced me! If you’ve tried other recipes from it that you love or have your eye on, LMK!